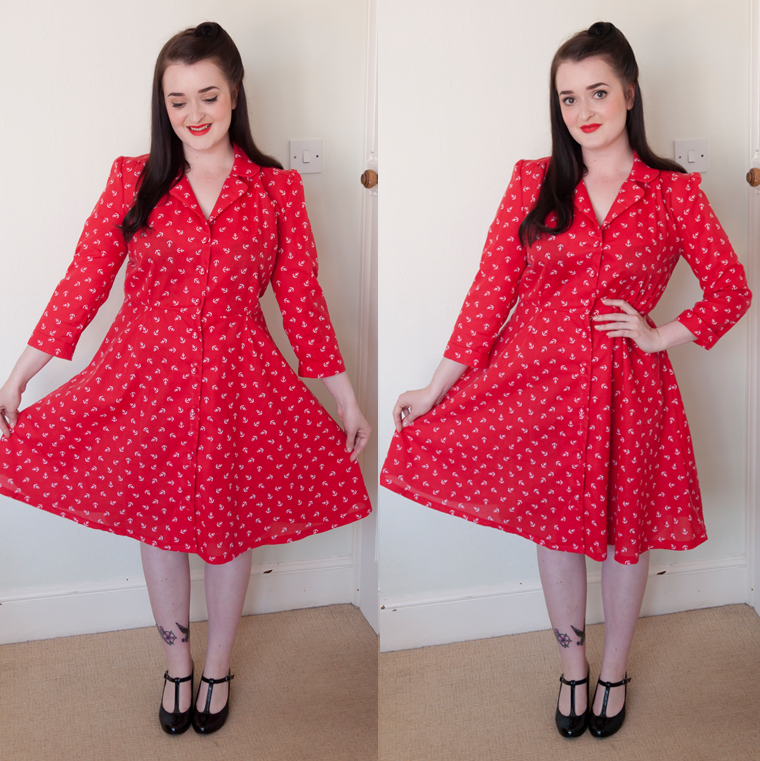 My finished Butterick B5209 1940s tea dress! 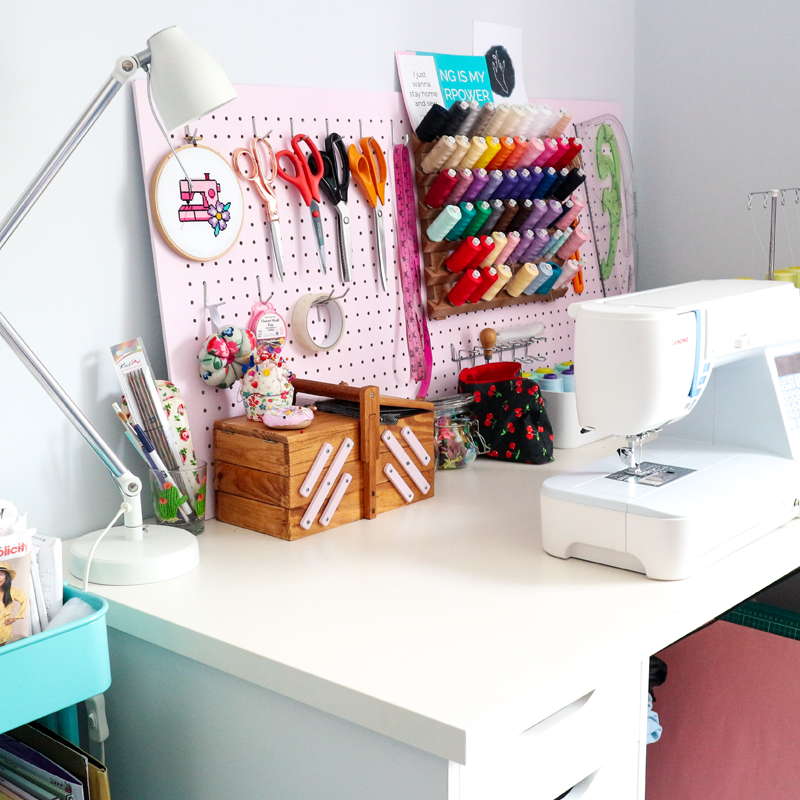 If you've been following my blog since I started back in April, you'll know about the plans I had for my Big Vintage Sew Along make! If not, you can read the post HERE. 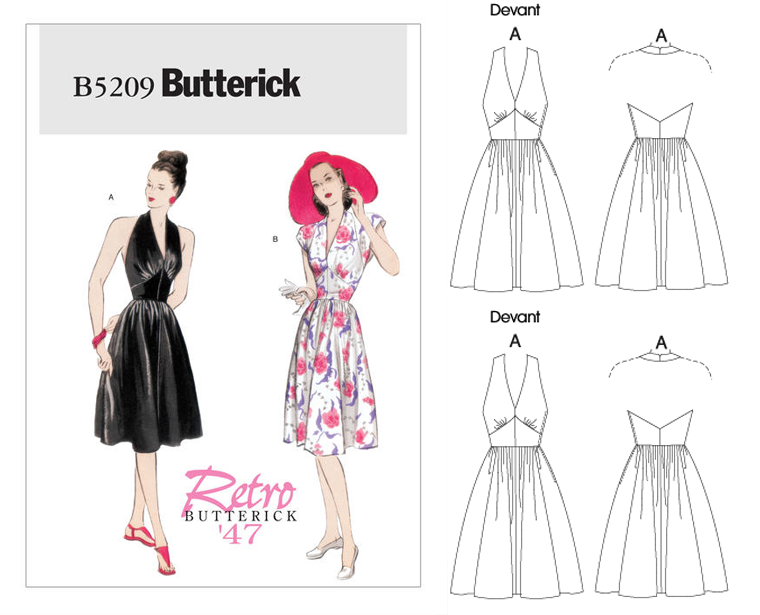 I chose the Retro Butterick B5209 pattern, a halter neck and tea dress from 1947. With plans to make the short sleeved tea dress style. 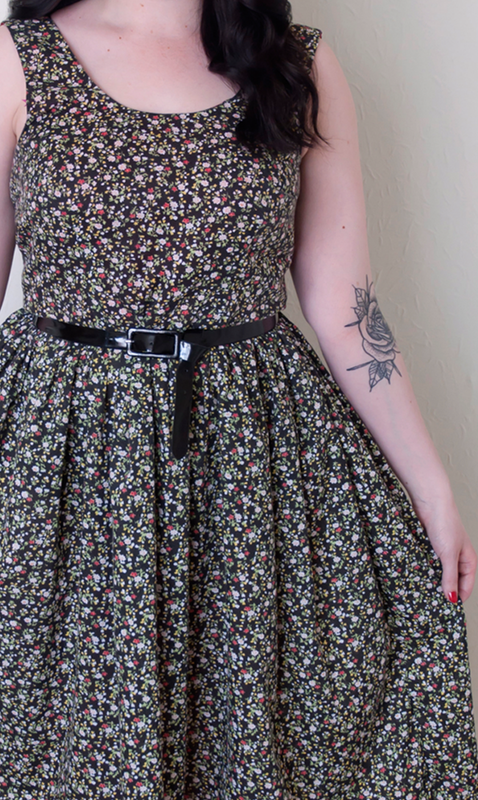 Possibly the most perfect fabric for a 40s tea dress ever! I decided last week that I should get round to actually making it! I was a little daunted by it so I'd been avoiding it. 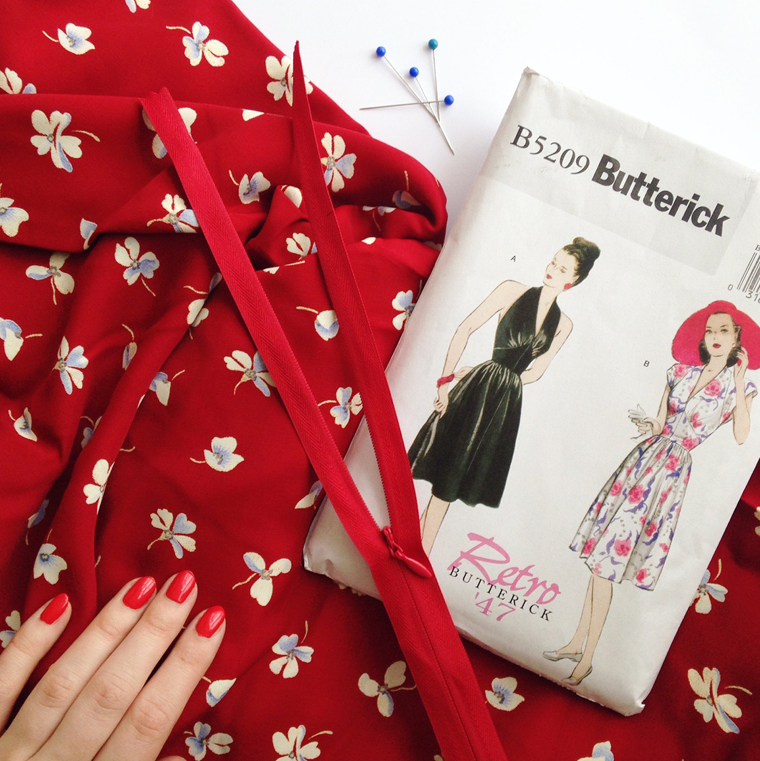 After sewing a couple of modern and easy to follow patterns recently, I wasn't looking forward to Butterick instructions again. To me, the pattern looks like a quintessential 1940s tea dress. With the halter neck version being a great option for a smarter occasions or a high Summer look. However, we don't get the sun enough where I am for me to get to wear the halter neck version, and I find tea dresses super flattering and thought I'd get far more wear out of it. Good hair days are the best! Straight away! Again, I had a sizing issue, the US size 12 is approx. a UK 8. And as I bought the pattern in size 6 - 12, I had already shot myself in the foot. So being the thorough, careful, sewist that I am (ahem...) I decided to just generously cut around the size 12. Roughly cutting out the US 14, which I think is a UK 10, but at this point I really have no idea! But I knew I had cut the pattern pieces generously enough for me to alter the fit later on. So, sizing issues aside. I went straight in to sewing the dress, step by step from the beginning. But it wasn't until I had sewn the lining in, overlocked my seams and went to the ironing board that I thought 'when do I sew the sleeves in?!'. In my auto pilot sewing mode I had managed to sew nearly the entire bodice for the halter neck version. I know, I know. It was a ridiculous mistake. I could have totally just carried on, and made a perfectly nice halter neck dress. But damn it, that's not what I wanted! I took a break, had a coffee, watched some Veronica Mars and sat and upicked for 2 episodes. Luckily I had enough fabric to cut out new waist band pieces, and I had cut everything out generously enough that loosing some of my seam allowances wasn't an issue. Stupid, self induced mistakes aside, I did find the lining construction quite tricky & the instructions hard to follow. I think being stressed out anyway didn't help. But it certainly gave me a headache! I ended up using common sewing sense more than anything, and inserted the invisible zip following instructions from a previous make. I got there in the end! The dress certainly isn't without it's issues, but I think I can get away with them! Some I feel are quite obvious, but not so much at a first glance. The center front isn't as sharp & tidy as it should be, the waist band is a little too loose and the under arms are messy from my lining construction. But after a good ironing, I still love the appearance of the dress and will be very happy to wear it out and about! Sewing time: I spent the best part of one day to start, which included cutting out, all my mistakes and unpicking. Then picked it up the morning after and finished by the afternoon. If I knew what I were doing and had made no mistakes, this could be done in a day for sure! Fit: Surprisingly good! Perfect on the bust for once, okay on the waist, a little baggy under the arms. Difficulty: I'm sure someone who hadn't made all the mistakes I did would find this pattern reasonably simple. 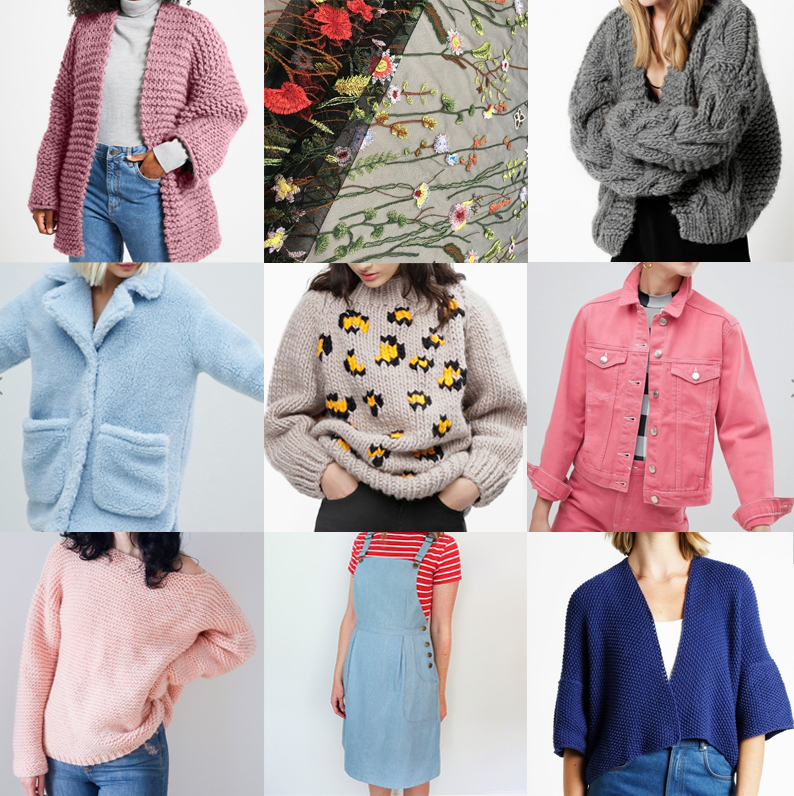 Watch out for: The lining. Make again? : Not any time soon! Overall, this dress gave me a headache but it was all my own fault. The fabric is beautiful and suits the style perfectly. Even though I know the dress has mistakes, to the untrained eye I think it looks very nice indeed and I'll still be very proud to wear it! I find the style flattering, it fits me nicely and will be great for dressing up and dressing down. To keep with the 1940s style I wore my white sheer six strap suspender belt with my favourite coffee seamed stockings. 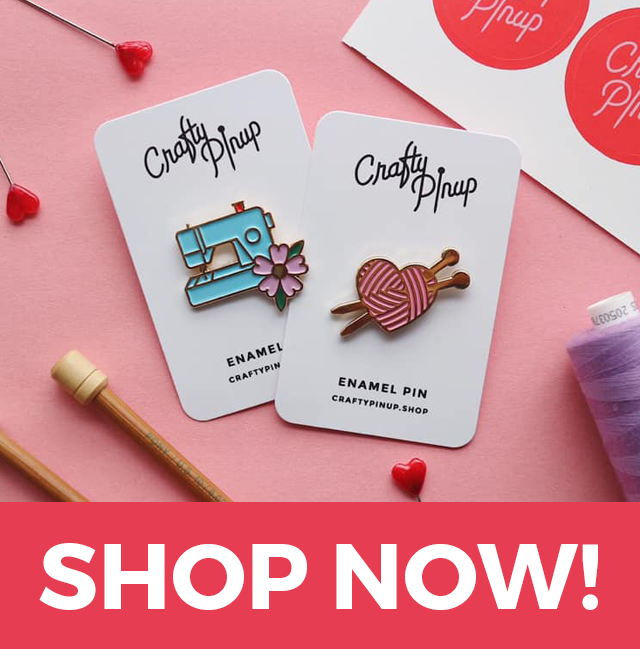 Both available from my store My Retro Closet. They finished the vintage style perfectly! 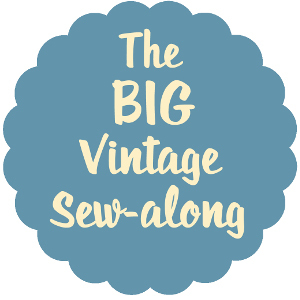 Are you taking part in the Big Vintage Sew Along? I'd love to see your makes! 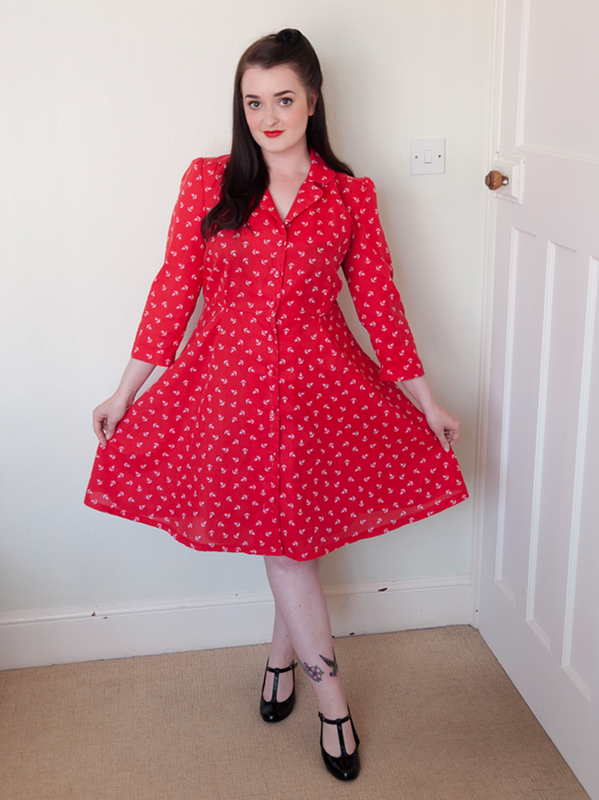 My finished Sew Over It Vintage Shirt Dress! This is my first time trying a Sew Over It pattern and it didn't disappoint! I love SOI's branding & their online store is fab. 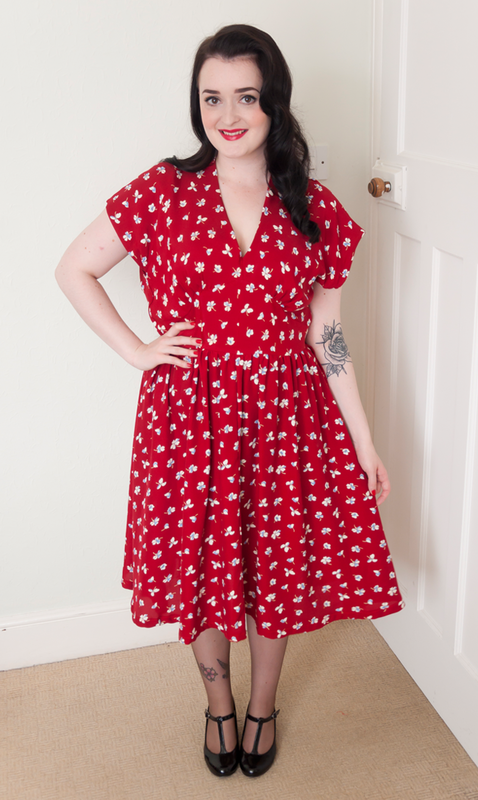 So when I spotted the vintage dress pattern bundle, I knew I had to make it mine and cheekily requested it from my boyfriend for my birthday in May. I thought I'd start with the Vintage Shirt Dress. 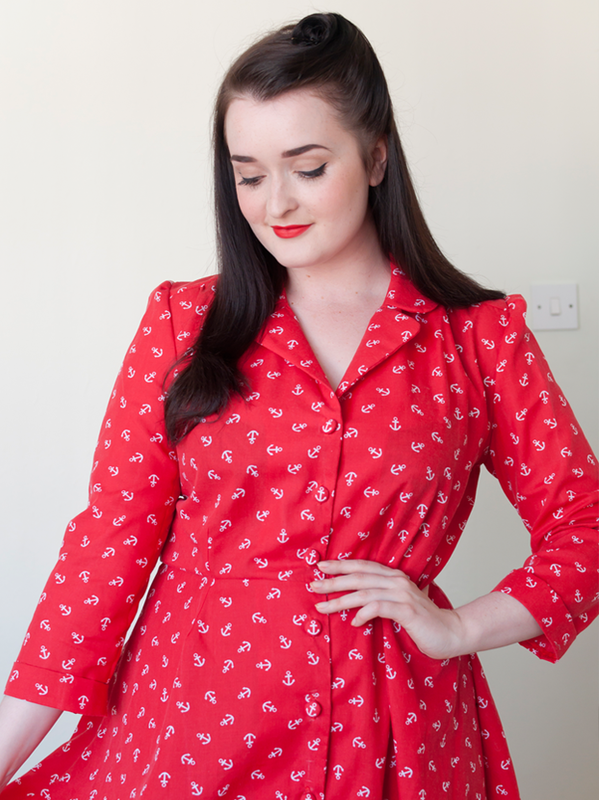 It's a classic retro pattern I love, you can see my previous shirt dress make here. 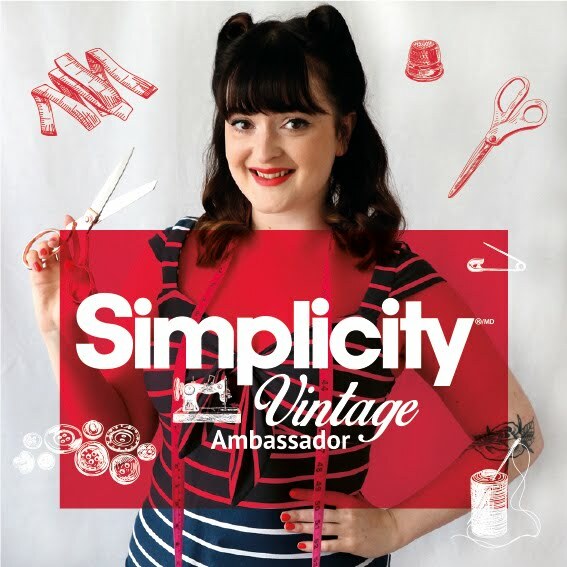 And after sewing a few true vintage & reproduction patterns recently I was looking forward to trying something with fresh and modern instructions. How lovely are the illustrations?! 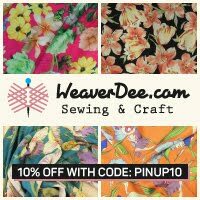 The pattern comes in beautiful packing, with all the sizing info you need clearly laid out. The instructions themselves come in a super handy booklet, much like Tilly and the Buttons patterns which I love as they are so easy to keep next to you while you're sewing. The booklet features illustrations rather than photographs, but they were really clear and very well done. I chose to make the three quarter length sleeve version in a poly cotton fabric. Everything about this make was really straight forward. There was nothing too fussy or over complicated and I made no changes to the pattern and I love the original length. It sits just on my knee which is perfect for me. Even though it is a rather straight forward pattern, I still can't seem to sew a collar perfectly. The point where you have to sew and pivot and then turn the collar back out to the right side, I can just never seem to get a really clean look. It might be that I'm not cutting the fabric as precisely as I need to be, or simply just my sewing. But next time I will nail this collar! How sweet are my self covered anchor buttons? 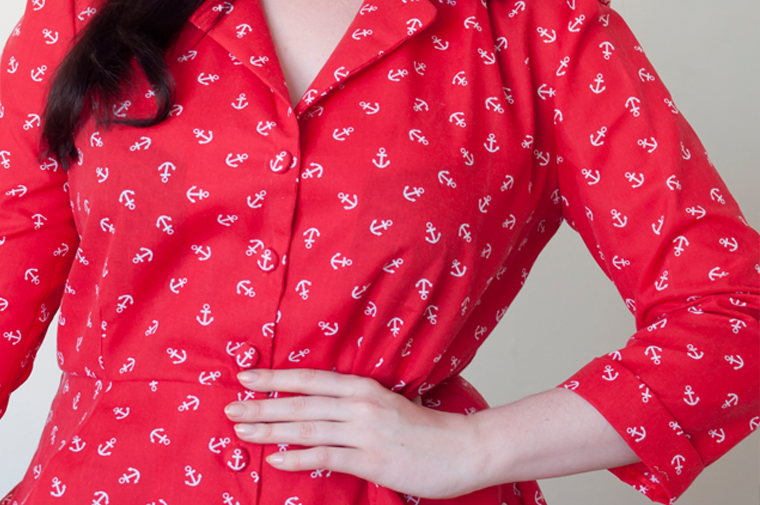 I knew as soon as I picked up this anchor print fabric that it would be fabulous for self covered buttons! I absolutely love the look of them. Although I can't take the credit for making them, as I enlisted my very handy boyfriend to make them whilst I sewed the button holes. He did a far better job than I can, there is zero fabric folds or creases in them! Even though I didn't make any modifications this time around, I'd love to try some rolled up t shirt style sleeves with a floral fabric. 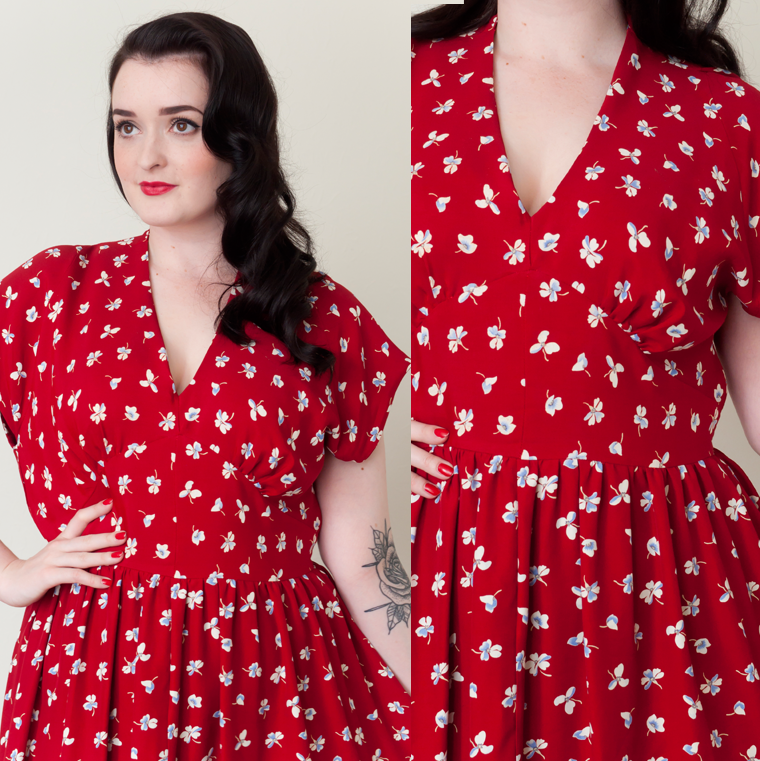 I love the 1940s feel of this dress and think a short sleeved floral number would be so cute for Summer! Sewing time: Half a day fueled with coffee and a boyfriend to make buttons for you! Fit: Very nice! But could size down (especially on the waist) for a more fitted look. Difficulty: Pretty simple! 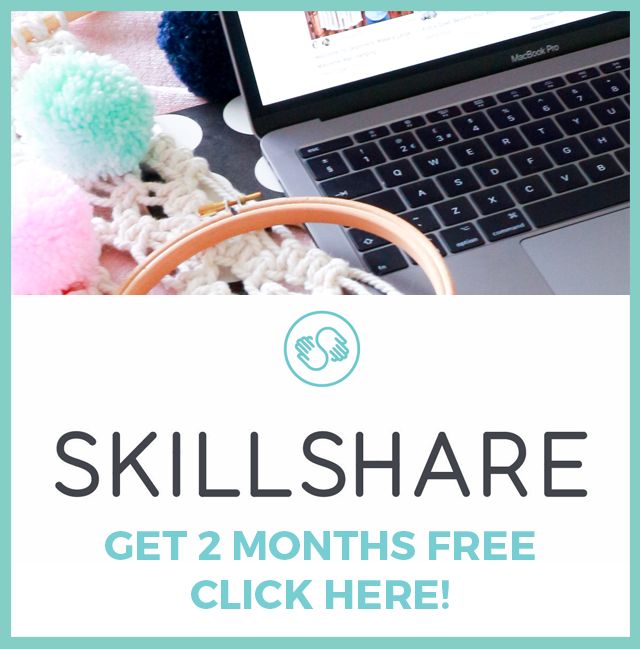 Lots of great little techniques to try if you're looking to progress from a beginner. Watch out for: The collar, I'm still trying to nail that technique! And button holes, but they're easy to learn. 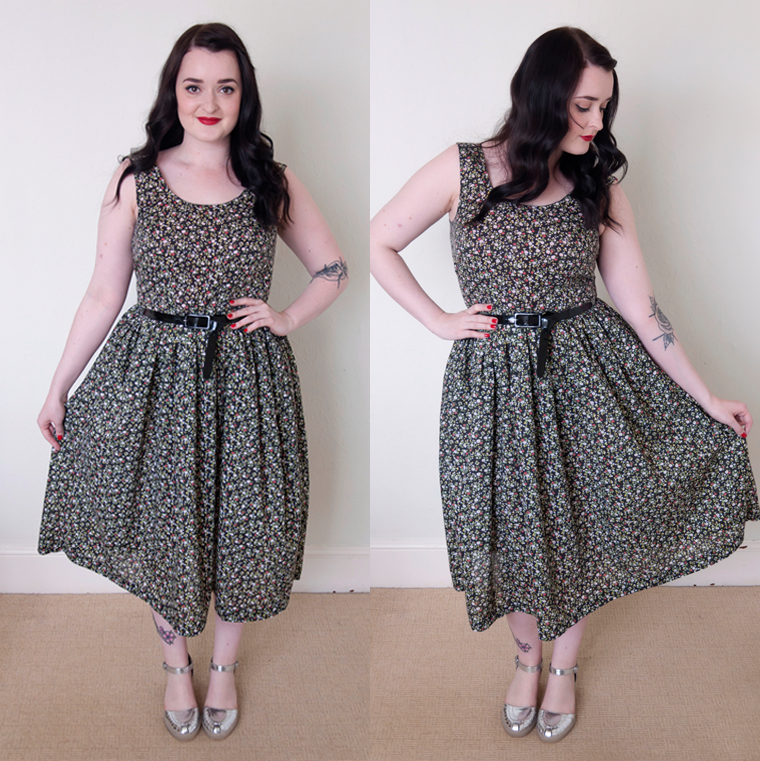 Overall I'm very happy with my new Sew Over It Vintage Shirt Dress. It's a fabulous edition to my wardrobe. It's smart enough to dress up for evenings but the fit is casual enough for every day wear. I even wore it out for a day of shopping in Birmingham the day after I finished it, I couldn't wait to wear it! 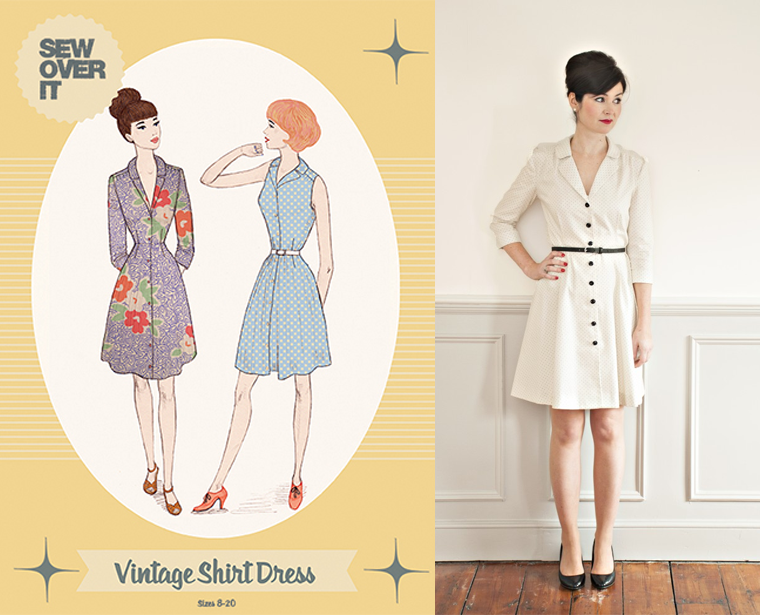 I can't wait to try my other patterns from Sew Over It's Vintage Pattern Bundle. 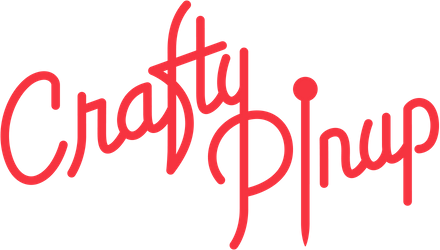 Have you tried any of their patterns? What did you think? 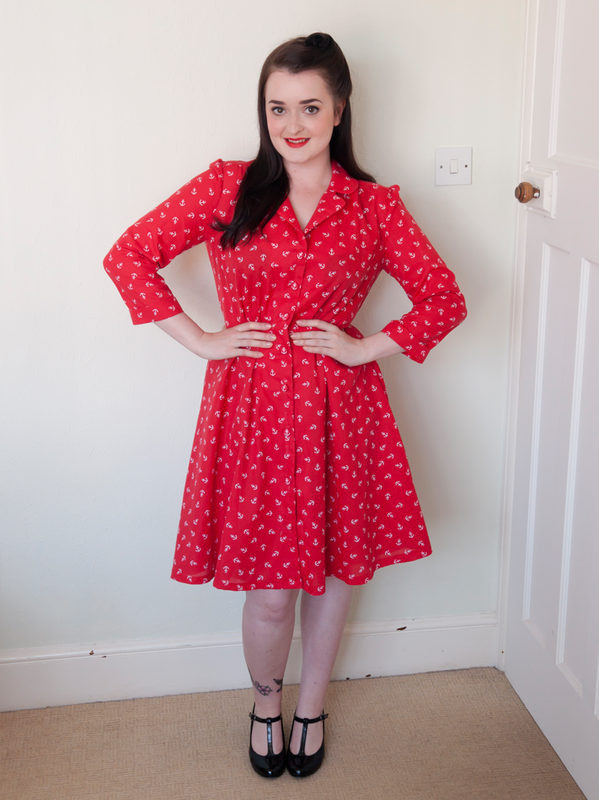 My finished Tilly and the Buttons Lilou dress! 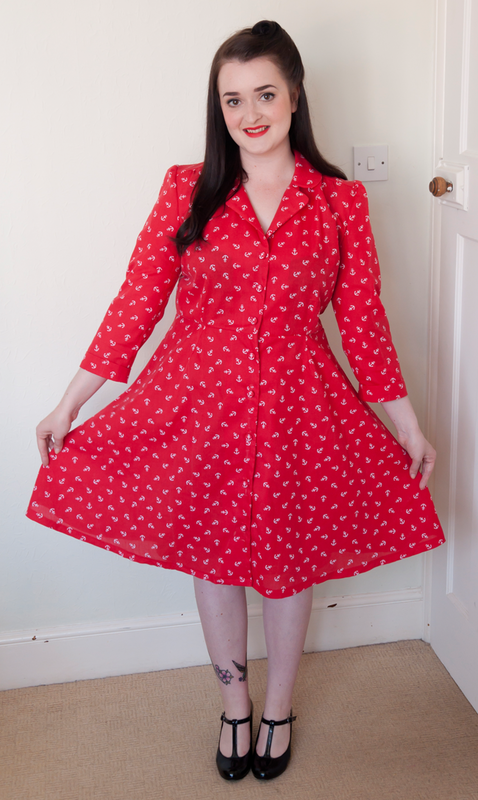 As you may already know, I'm a huge Tilly and the Buttons fan, and the Lilou dress was the first garment I made from her book 'Love at First Stitch'. But that's not the dress you're seeing here... My first dress was an over ambitious (I added the scallop neckline), shody attempt that I wore once until it unraveled in the wash. However, that was two years back and my dress making skills have improved a lot since them! So here's my Lilou dress, take 2. If you saw my previous 'Me Made May' post, you'll know my pledge was very feeble. It was to wear a handmade item on my birthday for the first time ever, and I sure did! I took this Lilou dress out for burgers & cocktails and felt very swishy indeed! 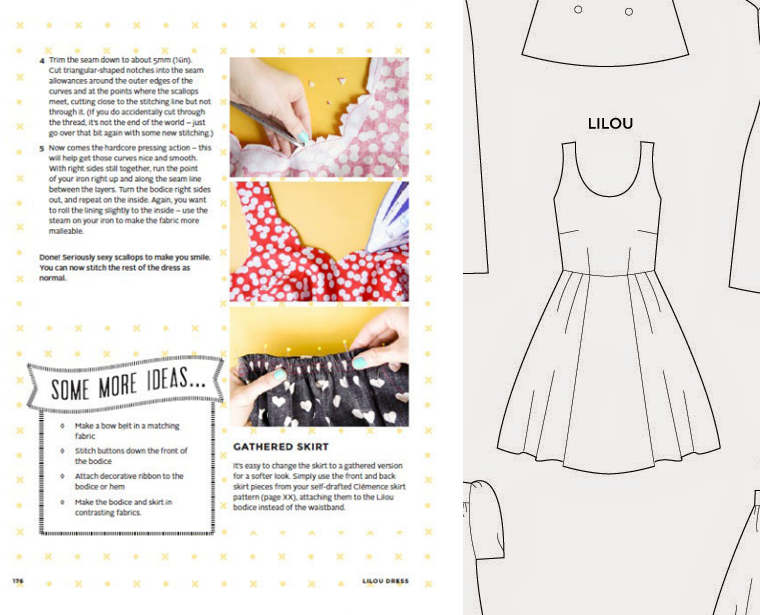 As usual, Tilly's instructions and photographs in the book make sewing her patterns super simple. 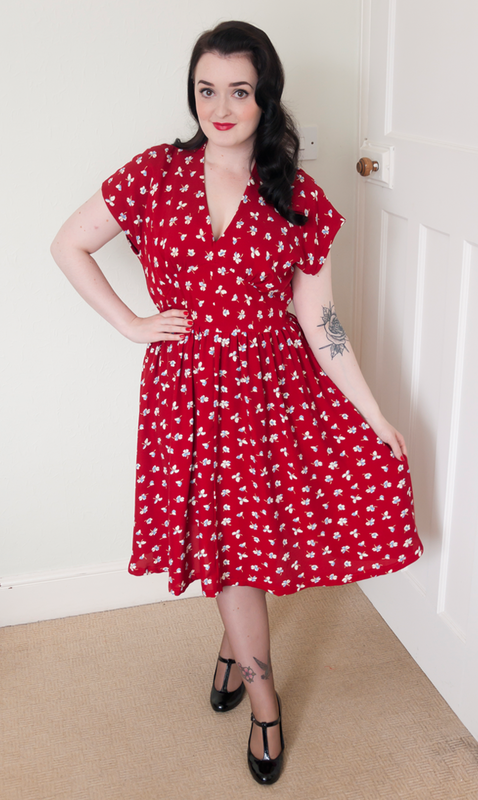 And considering this dress is last in the book (as the patterns progress in technique and difficulty), Lilou is perfect for beginners or sewists wanting to try bodice lining or inserting zips for the first time. I did make a couple of very minor changes to the pattern. I'm loving gathered skirts right now, so I swapped the original pleated version for the self drafted gathered skirt option. A style which Tilly shows you how to draft earlier on in the book. I also extended the length so it sits at calf length. I find calf length far more practical for casual every day wear. 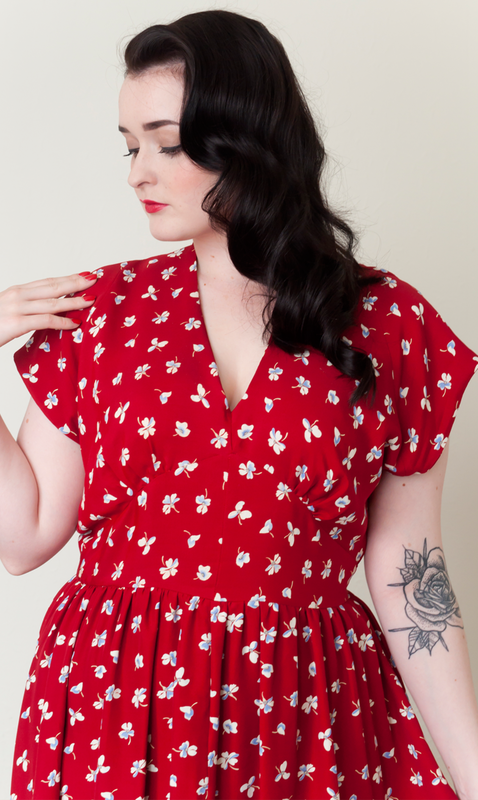 I love the contrast red lining with this gorgeous ditsy floral! 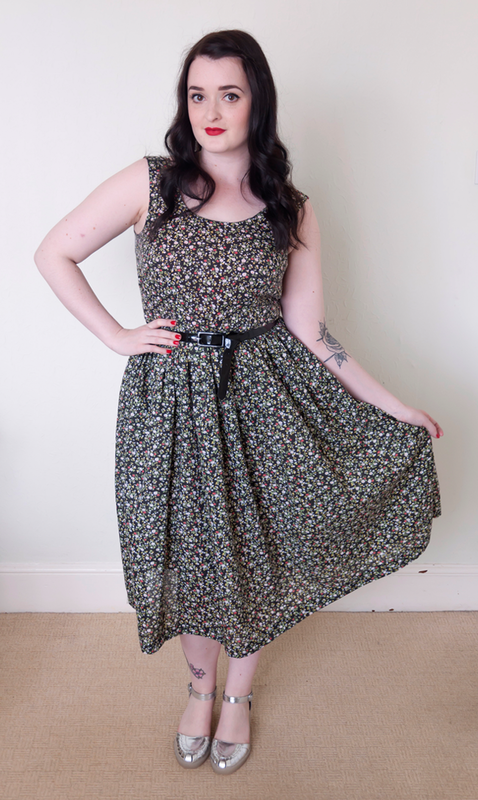 I wanted to create a simple, easy to sew, every day Summer dress. One I didn't have to be too precious with and one that would be nice dressed up or down. I chose an affordable polycotton with a lovely ditsy floral print and chose to use a contrasting cotton to line the bodice with. I did find the fabric in the skirt a little see through, especially if the sun was out. So I'd make a lined skirt too when I make it again, but in the mean time I wear this one with a slip underneath to solve the problem. The dress doesn't fit my torso as well as I would like. I think I must be short in the body, as I could do with taking out at least an inch at the shoulder seams. But that's something to alter next time as this doesn't make the dress unwearable, nor is it particularly noticeable. I'd also like to try the scalloped neckline version again, or maybe try a sweet heart neckline style. Fit: Okay. Need to shorten the straps for a better fitting bust. Difficulty: Pretty simple if you know how to do a bodice lining & invisible zip. Watch out for: Nothing too tricky here. The lining & zip insertions are both clearly explained. Make again? : Yes, yes, yes! Overall, this Lilou dress is exactly what I wanted to create. It's fast becoming my most worn item of clothing (not just from my handmade items) and have worn it for lunch out, chasing my dog in the garden and staying inside sewing when it's too muggy for anything else! I can't wait to make more. 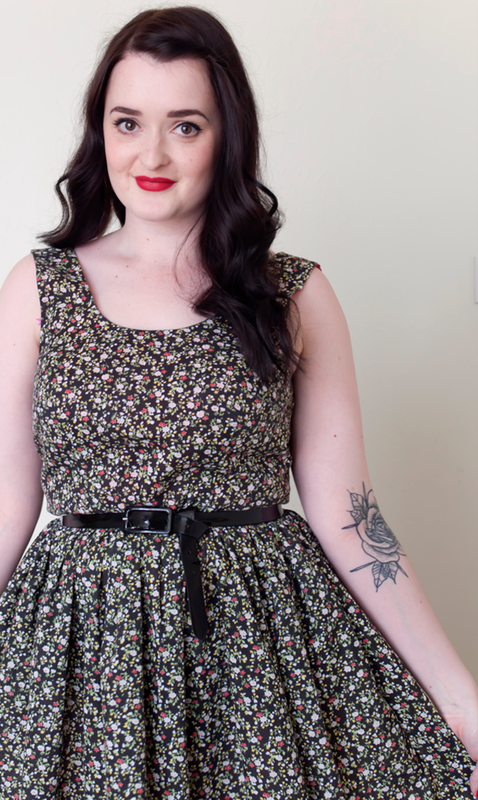 Have you made Tilly's Lilou dress? What's your favourite pattern from her book?